Here 5 hidden clues that reveal why Kattappa killed Baahubali. The dragging bloody sword: When Amarendra Bahaubali swore in as King, he vowed to the people of Mahishmati that he would not step back even if it meant taking his own life. So, was Kattappa instructed to kill Amarednra Bahaubali by the king himself? Was it a sacrifice made by the mighty king for the Mahishmati kingdom? The war within in the Kingdom: After Amarendra Baahubali was sworn in as King, there erupted a war between the brothers. 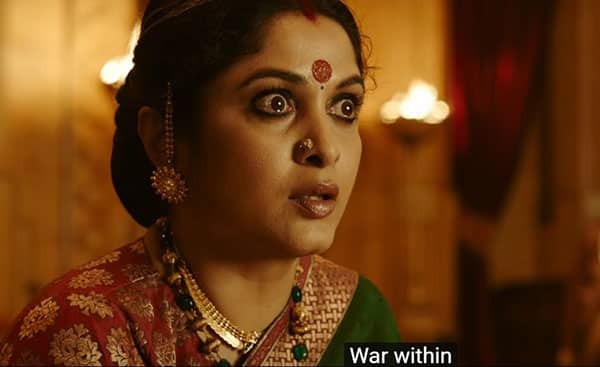 Kattapppa loyal to Mahishmati Kingdom had to choose a side, and do the needful even if it meant betraying Amarednra Baahubali. Amarendra Bahaubali’s mighty strength: “The scene where Amarendra Baahubali stated: As long as you are on my side, a man who can kill me hasn’t been born, uncle.” The line echos the king’s faith in Kattappa and his growing arrogance. Did Baahubali grow conceited and boastful of his strength, that Kattappa had to kill him for the welfare of the Mahishmati kingdom? When Kattappa bows down before Baahubali; This looks like the scene just before Kattappa kills Baahubali. The king’s arrogance is evident in this scene as no longer looks like the humble, selfless king. Power got the better of him and that’s why Kattappa had step in to save Mahishmati, as he is more loyal to the kingdom than the throne. Kattappa in his armour: This scene features Kattappa in his armour fighting someone within the kingdom. It yet again reiterates the fact that Kattappa is loyal to Mahishmati. What do you think? were there more clues hidden in Baahubali 2 trailer that revealed why Kattappa killed Bahaubali? Stay tuned for more updates on the much acclaimed Baahubali 2 trailer.